Eucalyptus, eucalypt and snow gum tree. Evergreen, perennial tree or shrub. To 8m height by 4m spread. Slow, reaches its full height in 20 to 50 years. Upright, columnar to spreading tree. Year round foliage and attractive stems, plus flowers in summer. Happy with any soil moisture levels. Can be grown in any soil type with an acid or neutral pH. Prefers a sheltered spot. The evergreen, grey underneath and green on top, aromatic leaves are rounded and arranged opposite each other when young. They become elongated and arranged alternately as the plant ages (hard pruning can maintain the juvenile foliage shape). These changes are known as ‘dimorphism’. Clusters of small, white flowers appear in summer. 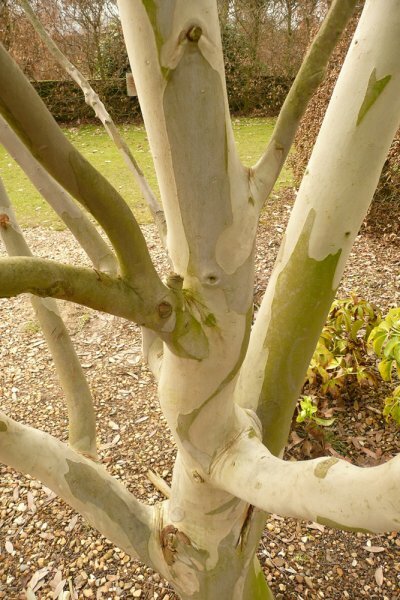 Young stems are red with a white bloom and, as they age, the bark flakes off revealing a patchwork of cream, light grey and green colourings year round. Great as a focal point or tall, architectural feature within a border. Good for a low maintenance garden. Eucalyptus plants should be purchased and planted when they are as young as possible to help them establish well, as they do not like root disturbance. When grown as trees, ensure that the plant is well staked so that the trunk grows straight. This eucalyptus can either be grown as a tree or shrub. Pruning should be done from winter to spring after any danger of hard frosts has passed. To grow as a tree, initially train it as a central-leader standard keeping the trunk clear to around 2m from ground level, you may find the lower limbs on the trunk die back naturally and can be removed as they do so. Once established, minimal pruning is needed. Lop-sided growth can be corrected by hard pruning (of the weaker side), thinning out the resulting growth to one or two strong shoots. 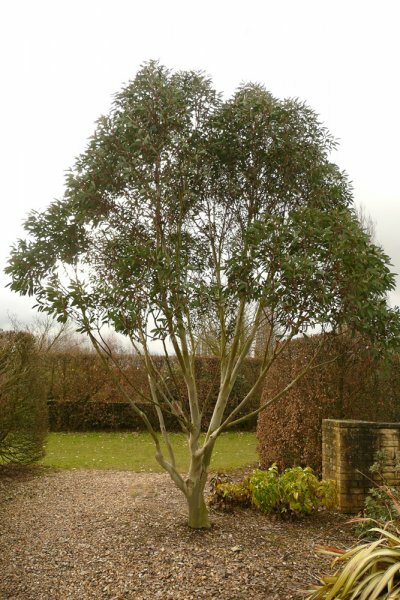 Eucalyptus trees can be renovated, or shrubs trained to become trees. Select a strong, vertical stem to use as the central-leader and then cut all the other stems back to ground level, or to the stump/trunk if there is one. Then train the tree as described above. This process is a better way of dealing with lopsided or damaged trees, rather than just removing one or two main branches. To keep the plant as a shrub (which will retain the juvenile foliage) you can pollard or coppice it annually or every other year in spring. However, if you already have a mature tree then it is unlikely to respond well to repeated pollarding or coppicing. Collect seed capsules when the capsules split open easily (this is a sign that the seed is ripe) and store the capsules in a paper bag in a dry, warm place for one to two weeks. Then split open the capsules and remove the seed, winnowing to remove the fine brown chaff which is also contained in the capsule. Cold stratify the seeds for two months at 3-5°C before sowing. Sow the seeds in root trainers or similar tall pots/cardboard rolls (they dislike root disturbance) and germinate at 15-20°C. Grow them on, then plant out after a year or so’s growth. 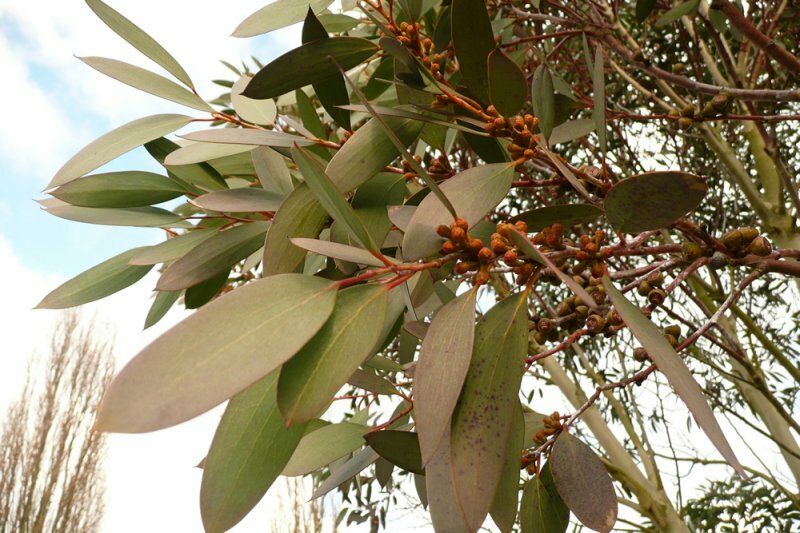 Blue-gum suckers can infest eucalyptus plants. Silver leaf and oedema can also be a problem. Young shoots and leaves are susceptible to frost damage. The eucalyptus was first brought to Europe from Botany Bay as a result of James Cook’s 1770 voyage. French botanist, Charles-Louis L’Héritier, named the genus after the Greek ‘eu’ meaning ‘well’ and ‘calyptos’ meaning ‘covered’. This was in reference to the operculum, a cap made up of fused petals and sepals which stays on top of the flower bud until it opens, protecting the reproductive parts of the flowers. Eucalyptus plants produce volatile oils, the commercial production of which dates back to 1860 when Joseph Bosisto (an immigrant from Yorkshire, UK) pioneered it in Victoria, Australia. The oil requires care when being used, stored and handled, and legal restrictions apply in some countries. The wood from eucalyptus plants is an important timber source, particularly since the plants can be cut down and will re-grow relatively quickly. It is also used to make paper pulp and charcoal.